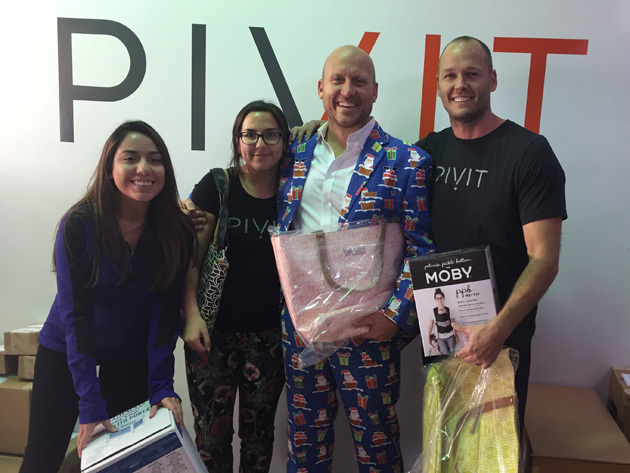 PivIT Global, an IT solutions provider and supporter of children in foster care, is giving back to the Santa Barbara community with a donation of new portable play yards, baby carriers, diaper bags and baby bottles. Angels Foster Care will distribute the baby-care supplies to local families who are fostering infants and toddlers. “We want to thank PivIT Global. Buying gear for a baby can really strain a family’s budget. Angels Foster Care parents will be delighted to receive these supplies,” Carmody said. PIVIT GLOBAL was launched in July by Justin Sparks, Joe Zender, Mike McKay and Troy Jacobsen of Santa Barbara. In addition to providing IT hardware, maintenance, and professional solutions, PivIT Global said it is committed to serving a larger social purpose. PivIT’s founders have been involved in the foster system for years and are passionate about supporting children in foster care, PivIT said. A percentage of every sale PivIT makes goes directly to supporting foster families and the organizations dedicated to providing stable, loving homes for foster children. Jacobsen said PivIT Global is happy to contribute. Angels Foster Care is a private, nonprofit Santa Barbara County Foster Family Agency that serves local foster children from birth to age three, and their siblings up to age five. The agency finds families for infants and toddlers removed from their homes due to abuse or neglect. Angels provides training and support for parents who welcome foster children into their families. Each family takes just one placement at a time and agrees to care for their foster child until the dependency court makes a decision about the child’s permanent home, Angels Care said. For more information about providing foster care to a baby or toddler, or fostering, then adopting, visit www.angelsfostercare.org or call 884-0012. — Holly Carmody for Angels Foster Care.